Brigida Gines, right, studies for citizenship in classes held at the Filipino Community Center in Waipahu. University of Hawaii student Eileen Moux, left, is a tutor in the class. BRIGIDA GINES SAYS she started to become an American on a trip to the Philippines in 1973. The citizenship change did not happen on paper or in any government office. Legally, she was, and still is, a foreign national. But it was on that trip -- her first back to her birthplace since immigrating to Hawaii nine years earlier -- that Gines realized the Philippines was moving on without her and that her home, where she raised her children and would become a grandmother and widow, was in Hawaii. So much had changed in her hometown of Mangatarem, she said. She began to accept that the Philippines, where she grew up, met her husband and had her children, was now simply a vacation spot. At age 80, after 41 years in the islands, the slight, feisty woman with a constant smile and piercing black eyes is preparing to apply for U.S. citizenship. "To me this place is my country already because I've lived here a long time," Gines said on a recent Saturday afternoon at the Filipino Community Center. "I need to vote. I want to vote before I die." Every Saturday this spring for three months, Gines showed up at the center in Waipahu for a free class that prepares immigrants for the process of becoming a U.S. citizen. She recently attended the course as a refresher, and wowed tutors as she quickly rattled off answers to the questions they threw at her: Who is the governor? When was the Constitution written? She hadn't been practicing much, she told them, smiling coyly. They laughed. GINES IMMIGRATED to Hawaii in 1964 with her three children -- two twins who were 7 at the time and her youngest, who was 3. Gines' husband, Ignacio, a contract laborer who worked as a welder with Del Monte, married her during a vacation in the Philippines in 1953, and had gone back every three years to see his family. He met his youngest child for the first time at Honolulu Airport. "I remember being tentative with my father at first," said Genevieve Gines Ley, who vividly remembers that first day in Hawaii. "My mom would tell me to 'give your daddy a kiss,' and I would be hesitant." For Gines the move to Hawaii meant being away from her family -- siblings, scores of cousins, her parents, aunts and uncles -- and the farming community she had grown up in. It meant living with a man she had really been with for only one month at a time. "I think it may have been difficult on her," said Ley, a doctor of internal medicine at St. Francis Medical Center in Liliha. "In the Philippines she was receiving American dollars (from her husband), so we were living at a higher socioeconomic strata. She had free say on how to raise us. Now, all of a sudden, she was negotiating compromises with this husband she had seen three times over 11 years." Brigida Gines, 80, has decided to get her U.S. citizenship more than 40 years after she moved to Hawaii from the Philippines. Last week, she reflected on her decision at the Pearl Ridge Shopping Center, a place she frequents. "I need to vote," she said. "I want to vote before I die." Gines was born to a poor farming family, the fourth of seven children. "Life was hard in the Philippines back then," she said, shaking her head. "Filipinos came here to seek a better life." Instead, many found more poverty, working back-breaking jobs on the plantations. But for the Gines family there was hope in Hawaii. The couple dreamt that their children would get an education. They saved as much as they could every month for college. "Education cannot be taken from you," she would tell them, "and it's the only inheritance we can give." One of her twins, Shirley, went to Stanford University and now owns a public relations firm in California. Ley went to medical school. And son Larry went into the Navy. Gines remembers her first years at Poamoho Camp in Wahiawa as the hardest. Most days, her children went off to school, her husband went off to work and she was left by herself -- a new immigrant with few friends. 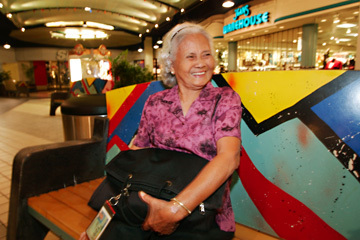 "I was feeling lonely," she recalled one recent morning, sitting on a bench at Pearlridge Center as she waited for stores to open. For a time, Gines worked at the Okimoto Drug Store in Wahiawa. But her husband wanted her to stay home to take care of meals, household chores and to make sure the kids, who were teenagers at the time, were hitting the books after school. It was difficult for Gines to leave the job, which had been one of few avenues to make new friends and feel a part of the community. "I remember my mother crying over the phone when she had to tell her boss that she had to quit," Ley said. At home, Gines spoke only English to her children. She thought it would help them assimilate more easily, especially in school. When they arrived in Hawaii, the children spoke only Ilocano. Ignacio Gines detested the thought of an English-only Filipino household and would frequently speak to his children in their native tongue. Eventually, though, the children lost the language. 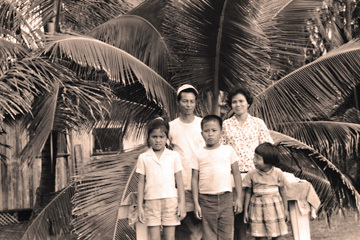 The Gines family poses in front of their home at Poamoho Camp in Wahiawa, where they lived for seven years after Brigida Gines and her children immigrated from the Philippines in 1964. Brigida Gines' children now subtly resent her, she said, for forcing them into English. 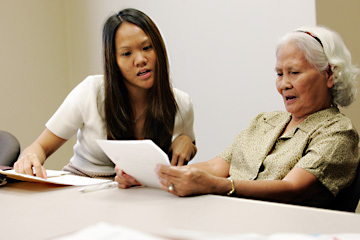 To make up for it, she tried to teach her grandchildren Ilocano when they were young, but her daughter-in-law was worried their English learning would be stunted. "I should have let her do that," said Perl Gines, who also immigrated from the Philippines as a child. "Now, when we're adults, we kind of tend to think that we should have paid more attention to our ancestry, our background, our language." Ley suggested that Gines' two grandchildren, 19 and 16, accompany their grandmother on a vacation to the Philippines later this year. They have never been to the country, never met their cousins who are still working the family land. "They know they're Filipinos, but what does that mean to them?" Ley said. "They see all the superficial trappings. But what will it be like to see the poverty there, to see their cousins who are poor?" Only Gines keeps ties to the Philippines, returning every few years to visit family. Ley and her siblings were teenagers when they last returned to the Philippines in 1973, just about her niece's and nephew's age. "They liked the place," Gines said, letting out a quiet sigh, "but they knew they didn't want to stay there permanently." Island Television News at 5: Mixed Plate Mabuhay. Pamela Young goes to the Manila Polo Club ballroom for an evening with Manila's frisky socialites. Island Television News at 10: Meet Tim Los Banos, a fifth-generation Filipino who is keeping alive the story of his Sakada ancestors by becoming the family historian. You'll see his amazing pictures documenting an era gone by.